President Trump's first budget can be summed up like this: Big gifts for the rich, big cuts for the poor. He would give a lot more money to the defense industry and wealthy taxpayers, and he would pay for that with an unprecedented slashing of safety net programs for America's poor. It's a "tanks and tax cuts" budget. Mulvaney probably should have added a fifth bullet: Disability programs also get a massive haircut. Advocates for the poor are stunned at the magnitude of the cuts. 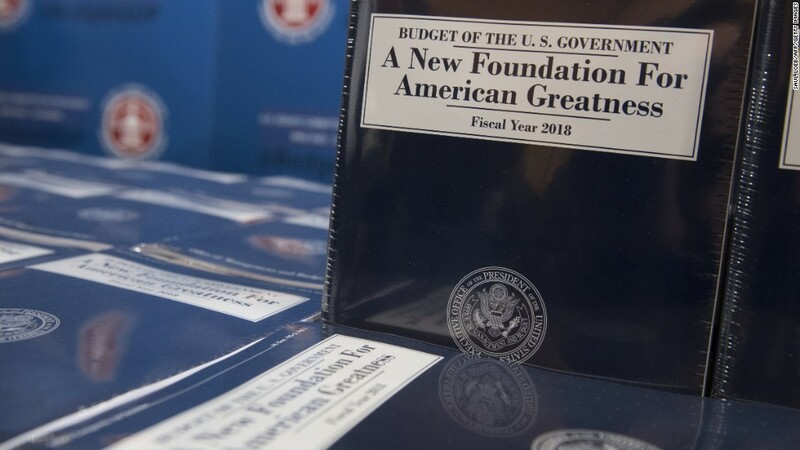 It's a "reverse Robin Hood agenda," says the Center on Budget and Policy Priorities, a left-leaning think tank that is one of the top voices for low-income Americans in Washington. The Trump administration is strongly defending this as a "taxpayer first" budget. But it's a mystery whether a typical American family will be any better off under Trump. The White House has given out only a one-page outline of its tax plan. There's so little detail that even tax policy experts can't figure out if the middle class gains or loses. What is known so far is that the wealthy -- including Trump himself -- would likely pay a lot less in taxes. "The majority of the benefits go to high-income people," says Joe Rosenberg, a senior research associate at the Tax Policy Center, a nonpartisan think tank. All the top tax rates on businesses and individuals go down. He also eliminates the Obamacare surcharge on wealthy investors. Trump is giving rich investors (who earn over $200,000 a year) a tax break while half of America has nothing invested in the stock market, mostly because they don't have extra money to invest. Arguably the biggest gift to the rich is eliminating the estate tax. Right now, it only applies to estates worth over $5.5 million, but Trump wants to get rid of it entirely. The estate tax is assessed when someone passes away and her heirs get the property. Passing on wealth from one generation to the next is one of the main drivers of inequality in America. Even some on Wall Street are surprised by this budget. "This is the centerpiece of the spending proposal -- cuts of nearly $1 trillion over 10 years in Medicaid, food stamps and other anti-poverty programs," says Greg Valliere, chief strategist at Horzion Investments who writes a daily take on politics. He predicts this budget will hit a "brick wall" in the US Senate. Senators know that these programs touch almost every part of the country. Nearly 1 in 5 Americans use Medicaid, and over 1 in 10 are on food stamps. A substantial number of people on government aid voted for Trump. CNNMoney met some of them in Kentucky. Seven of the top 10 states with the greatest proportion of their residents on food stamps went for Trump. The critical swing state of Florida was among them. 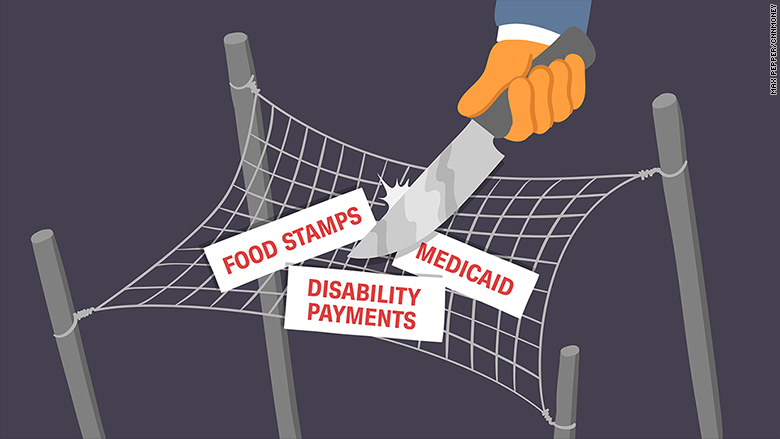 In addition to food stamps, Trump also slashes Social Security Disability Insurance, a core program to help people who are physically unable to work, and Temporary Assistance to Needy Families, a key welfare program. "We believe in the social safety net," Mulvaney told reporters Monday. He argued Trump can get millions of people off of government aid and back to work. "If you're on food stamps and able-bodied, we need you to go to work," Mulvaney said. The main complaint from businesses, however, is they can't find skilled workers. People coming off of government aid are overwhelmingly poor. They typically lack the education and training for the high-tech economy. "We are essentially back at full employment," says Douglas Holtz-Eakin, head of the right-leaning American Action Forum and a respected budget analyst. "I just don't think we'll move more people from government rolls to work." Experts across the political spectrum say the biggest problem with Trump's budget is that the math doesn't add up. It will almost certainly add trillions to the debt. Trump promised not to touch Social Security or Medicare on the campaign. Balancing the budget requires reforming those two key programs. The president is already backtracking on that vow a little by proposing cuts to Social Security Disability Insurance, but Mulvaney argues that's a different animal than Social Security for the elderly. On top of that, Trump also adds $54 billion more to defense spending and "the biggest tax cut in the history of this country." Put all that together and there's nothing left to do but take a butcher's knife to the rest of the budget. Liberals decry the cuts to the poor, especially programs like food stamps that keep millions of American children from starving. Moderate conservatives worry about cuts to education and scientific research. About every economist agrees that innovation and training kids for the jobs of tomorrow are critical to a healthy economy going forward, especially if Trump hopes to take America from 1.9% growth a year to 3%. Trump eliminates "all of the domestic discretionary funding where you genuinely invest in the future: education and basic research," says Holtz-Eakin. The budget so far is shaping up as good for the wealthy, terrible for the poor and a question mark for the middle class.